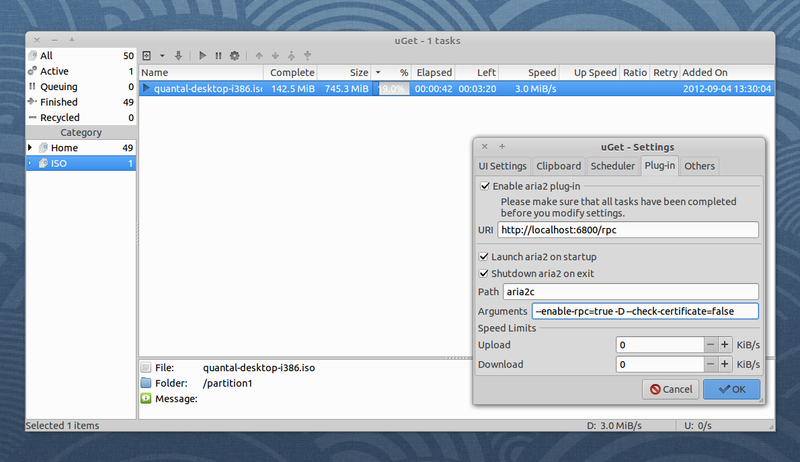 uGet is a multi-platform GTK3 download manager that supports resuming downloads, comes with categories support, can download torrent and metalink files through aria2, a powerful command line download tool that's integrated into uGet. 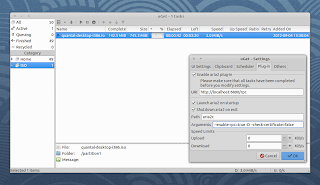 Other uGet features include: scheduler, clipboard monitoring, can be integrated into Firefox through Flashgot plugin, can import downloads from HTML files, supports batch downloads and more. The application also integrates nicely with the Ubuntu desktop by making use of an AppIndicator and NotifyOSD notifications. aria2 plug-in use argument "continue=true"
Also, uGet now depends on GTK 3.4+ and GLib 2.32+ so it won't be available for Linux distributions that ship with GTK 3.2 like Ubuntu 11.10. For source files, .rpm and Windows binaries, see the uGet download page. 1. If you're upgrading uGet from an older version, to get the aria2 plugin to work in uGet select Edit > Settings and on the "Plug-in" tab, under "Arguments", replace "--enable-xml-rpc" with "--enable-rpc=true -D --check-certificate=false" (without the quotes). 2. If aria2 is not working with uGet, run "aria2c --enable-rpc=true" in a terminal firstly or "aria2c --enable-rpc=true --disable-ipv6=true".